We design each system individually to ensure maximum energy efficiency for the room or area, taking into account the heating requirements of the room, position of doors & windows, potential problems with existing insulation, proposed use of the area etc. Areas are zoned and individual thermostatic controls provided as necessary. Proper thermal insulation is vital - both in the floor, and in the perimeter. Any gaps or voids will seriously undermine the effectiveness of the system. Insulation can be achieved effectively and economically by using Kapron board where required. 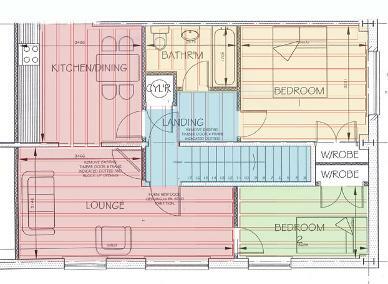 Kapron insulation board is fitted as required and then the heating elements are laid according to the planned layout. So long as care is taken that the narrow embedded copper braids along the edge of each element are not damaged, the elements can be stapled or even nailed with no effect on performance. No other system can do this. Cement mortar or latex-modified mortar or tile adhesive can be used directly over the element for levelling or when installing tile or resin flooring. The elements are connected according to the plans and electrical diagram. Obviously the gauge of the wire is determined by the load but it is always simple to ensure that the wiring is left no higher than the element itself, so levelling the finished floor surface is not a problem. Wires can be flat on the floor, up or through the wall in conduits, recessed into the insulationboard or below the subfloor. Connection is made the 24 volt EP Transformer. The maximum load per circuit is 450 watts and of course must be made in accordance with current regulations. Connection to the mains supply must be certified by a qualified electrician. 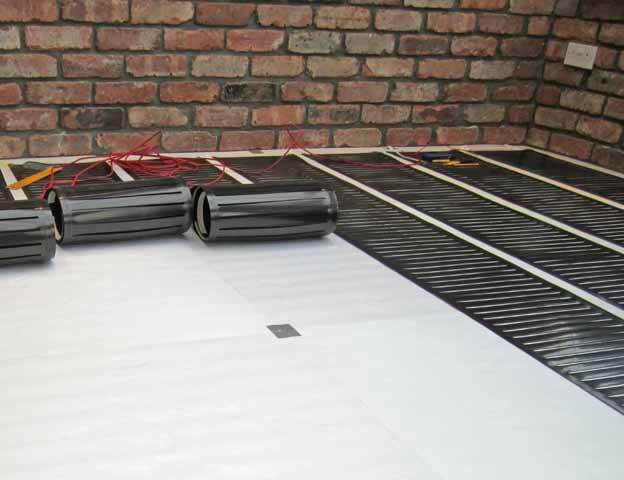 EPWarmfloor can be fitted under any type of floor surface or covering, providing safe, well-regulated heat with minimum energy use. The system can also be used equally well in walls, ceilings or even outdoors to keep driveways or paths ice-free, or in greenhouses or animal pens. 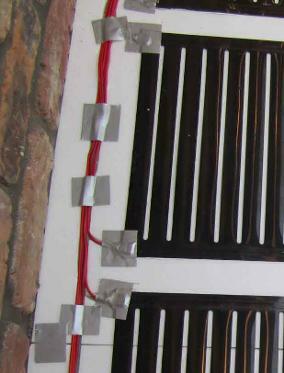 For maximum efficiency the heating elements have to be in direct contact with the finished flooring, with no air gaps. In bathrooms, showers, and wet areas, the heating elements should be installed under a waterproof membrane. Read more about how Warmfloor will work with different types of flooring HERE. Installation must conform to local building codes, regulations & trade practices. The installation must be checked by a qualified electrician in accordance with current regulations BEFORE the element & wiring is covered. Consult insulation manufacturer for deflection/load characteristics, and check that the product and installation procedure is approved for the application. Any installation not done in accordance with manufacturer's instructions may invalidate the guarantee. For more technical information click HERE to download our INSTALLATION GUIDE. It is perfectly possible for you to install the system yourself, so long as connection to the mains is certified by a qualified electrician. However we do have a list of experienced independent installers who would be happy to quote for full or part installation, or just for checking and certification if required. Just ask us for details of installers in your area.